PIERRE, S.D. — Michael Saba ’65 has spent a lifetime trekking the globe. It seems ﬁtting his next pursuit in life is as a member of the South Dakota House of Representatives in Pierre, South Dakota. His newest adventure brings him nearly back to his hometown of Bismarck. But, it isn’t like Saba, the former Peace Corps volunteer, Mobil Oil manager of Middle East Affairs, director of international development for Avera Health, executive director for development for Sanford Children’s Clinics, and vice president for inter-national development for ALSAC/St. Jude Children’s Research Hospital, is looking for a retirement gig. 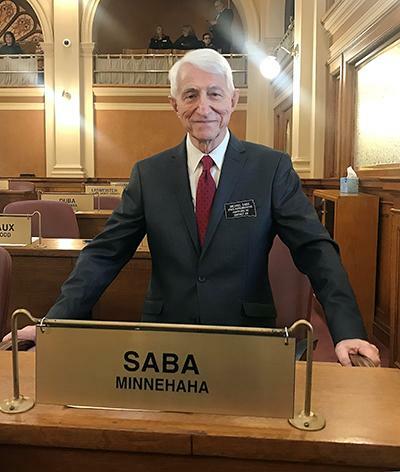 “I’ve always been interested in politics, going back to running for the United States Senate in North Dakota in 1980,” Saba said. “But I didn’t really want to run again. The party kind of found me. I had moved to South Dakota and was getting to know people and people were getting to know me, and I just started to go to some meetings. I was tremendously inspired by the Women’s March (last year) and felt this is women’s time in politics, and I was committed to finding three women to run here in our area. I helped find two but told the party if we couldn’t find another, I would run. While his politics might differ from the majority, he isn’t backing down from his convictions. Saba sees himself as a champion for the taxpayer, for international business, and — most importantly — as a bridge builder. “When I’ve talked to my Republican colleagues and they ask what am I going to try to get done, I’ve told them I will put the taxpayer first,” he said. “That is very important to me. And, international business is a big thing for me, something I’ve been very good at. I’ve led delegations from both North and South Dakota; I feel that is a strength. After I’ve explained that, they look at me and say, ‘Are you sure you’re a democrat?’ To me, that’s one of our problems, too much of politics is polar-ity. That’s not good for our country or our state. Saba’s international business has its roots from an unlikely place — the Peace Corps. It was still a concept and didn’t have a name when he first heard about the pro-gram during a speech from then Senator John Kennedy. During his time in the Peace Corps, his penchant for helping others, especially children, began. He worked as a teacher in Malaysia and Thailand in the 1960s and helped build a children’s hospital in Egypt, setting in motion a passion for helping that led to his involvement in Avera Health, Sanford Health, and St. Jude Children’s Hospital. Saba took a chance to introduce himself to Kennedy during the campaign speech in Fargo. It wasn’t his first meeting with a sitting or future president, nor was it his last. He has met every former president since Eisenhower except for former President George W. Bush — of whom he feels confident he will still get to meet. Some of it has been being in the right place at the right time and some has been a mantra of adventure handed down from his father, Naif. His meeting with Kennedy and the creation of the Peace Corps also prompted his move from North Dakota State University to Minot State, where he would earn biology and teacher education degrees. His sense of adventure almost cost him everything, however. While working on putting together a conference with Western and Middle Eastern oil companies and government officials in 1990, he was rounded up by Saddam Hussein’s regime and held hostage for 10 days in the Al Rasheed Hotel in Baghdad. Iraq had just invaded Kuwait. To add to the dilemma, his wife was eight and a half months pregnant with their youngest son, Daniel. The Americans in Baghdad were moved to the Al Rasheed and remained there. After 10 days, Saba — with the help of 1960s British pop singer Engelbert Humperdinck — decided he was not going to miss the birth of his child and escaped with another American via taxi to the Jordanian border. After his harrowing escape, Saba worked to release the rest of the hostages, joining a delegation that included boxing legend Muhammad Ali and former Texas governor John Connally. Saba later testified before Congress and appeared on shows like “Nightline” and “Oprah” to communicate the story of bringing hostages home and later met Humperdinck after telling the story of his escape. The freshman senator from Sioux Falls will use his expertise from decades of life lessons as he begins to navigate his first foray into public service.